Michael McVeigh is an assassin for the CIA. This highly dedicated agent is trained to go undercover for as long as needed to get close to a target and then to use whatever means were necessary to eliminate him. Whether it is hands, a knife, a garrote, or a gun, McVeigh had the expertise and the nerve to carry it out. The only child of a Florida cowman and a Seminole Indian, McVeigh learned at an early age how to fit into two different worlds, a training that would be helpful during his later career. From his uncles on his mother's side, he learned in the swamps of the Everglades how to fend for himself. He also learned that a rash move, unthought-of or unplanned, could get you killed. Just as important, though, he learned that not being able to react instantly was another way to death. As a young adult, McVeigh joined the U.S. Air Force out of college, being a pilot. It was as a pilot on an assignment connected to the CIA that McVeigh met a senior Agency official named Rosen who liked what he saw in the pilot and his quick response to problems. McVeigh was sent to train at the Agency’s various farms, learning the many tricks that they had to show and he learned them well. Finishing, he was transferred indefinitely to work for the CIA. 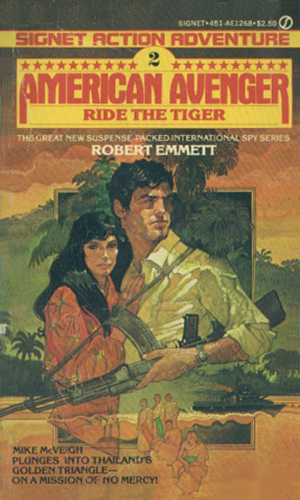 For his covert, highly dangerous wet work, McVeigh receives a sizeable bonus for each assignment. He certainly earns it, taking jobs that most sane people would walk away from, but he believes in what he is doing and he enjoys the danger and the challenge. He might do it for nothing but that would be foolish and McVeigh never does anything foolish. McVeigh is in Berlin to find out what is being tested by the Soviet in deep in an East German mine. Also wanting that information is a West German agent and temptress but a female Soviet agent is determined to stop them both. In exchange for fifty million in cash, a renegade Chinese general holding up in a fortress deep in the countryside is willing to hand over a defector with information that could give the U.S. a decided edge against Russia. McVeigh is the courier. Someone has come up with a weapon that can attack satellites from the ground. It has already taken out several. McVeigh is ordered to find who and stop them, getting the technology as well if possible. 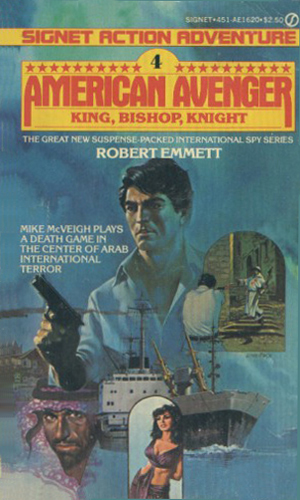 McVeigh goes undercover in the Arab kingdom of Burun as a new employee of its fanatical ruler. He finds himself at odds with the man behind the throne who is power hungry and determined. His only help is a woman CIA agent in deep cover with her own lust for control. In the mountain of northern Greece, a communist terror team is ready to attack NATO defenses with a scheme that could easily work. 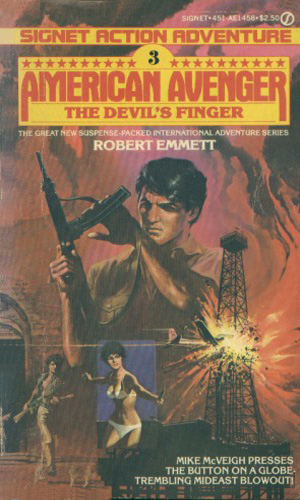 McVeigh is sent undercover as an American paratrooper to find and stop them. 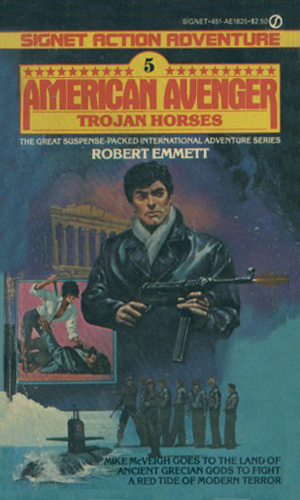 I wonder how branding this entertaining but largely action-oriented series of adventures as those of the American Avenger helped or hurt sales. Coming out in the early 80s, they missed the testosterone-filled days of the 70s which saw the popularity of the Executioner, Destroyer, Death Merchant, Butcher, and so on, so I don't think that was the goal. Perhaps it was the malaise of the Carter Administration which brought Ronald Reagan into power with such authority and the boldness and patriotic fervor that again filled the country. Seems more likely, now that I think of it. 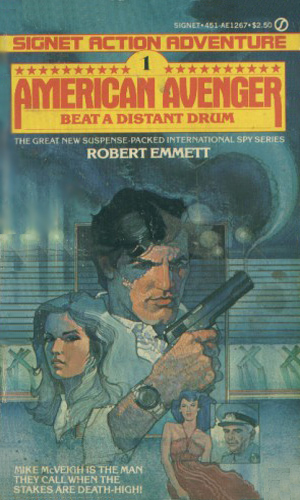 Whatever the cause, though, I felt back then and still do today that calling your main character the American Avenger is hokey. The stories are fun reads, though. Mostly gun play and love making with a few fistfights and bombs exploding but there is never a bad time for a blow-em-up, I always say. And a beautiful, scantily-clad temptress is never unwelcome.